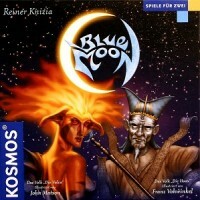 Blue Moon is a collectible card game for two players, often compared to Magic: The Gathering, although it has very different game mechanics.It is set in the fictional world of Blue Moon, where different peoples fight for dominance of the world and the favor of the Dragons. The standard game box contains the 'Vulca' and the 'Hoax' decks, a small game board and three small plastic dragon miniatures, used as scoring counters in the game. Add a Review for "Blue Moon"